Karen Grecus holds signs at last week’s open house meeting at Nelson County High School/Photo by Lee Luther Jr. Though Dominion Resources intended for its second open house event in Nelson County to be much like the first one held in September, those who attended had a few surprises in store at the Jan. 14 meeting. “We felt the songs would well-express our passion and solidarity in opposing the proposed pipeline,” said Free Nelson organizer Marion Kanour. A self-described conservative, business-friendly Republican in the Virginia Senate hopes colleagues in the General Assembly will repeal an increasingly controversial state law that grants natural gas companies the right to access private property without an owner’s permission to study and survey the property, without compensation, for a possible pipeline route. Sen. Emmett Hanger, R-Augusta County, emphasized that he supports the Atlantic Coast Pipeline and believes it could add vital natural gas infrastructure. 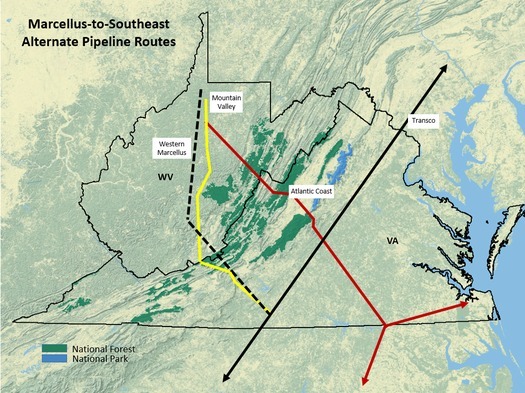 Map by Appalachian Mountain Advocates. 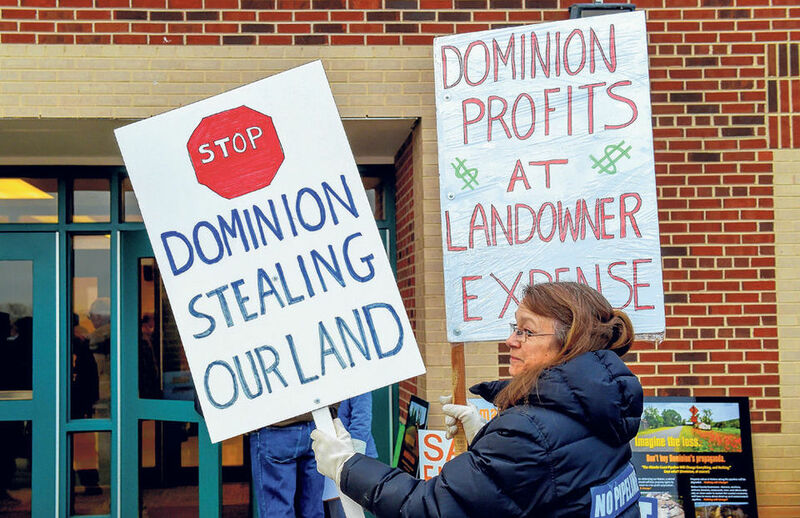 RICHMOND, Va. – Hundreds of Shenandoah Valley landowners are refusing to let Dominion survey for the Atlantic Coast Pipeline. The power company is suing about 50 property owners and says it will sue more.